A United Launch Alliance Delta 4 sits poised on its launch pad with the classified NROL-27 satellite for the National Reconnaissance Office at the Space Launch Complex-37 at Cape Canaveral Air Force Station in Florida. A medium-class version of United Launch Alliance's Delta 4 rocket will give a lift to the National Reconnaissance Office and a clandestine cargo tonight (March 11) night with blastoff from Cape Canaveral. 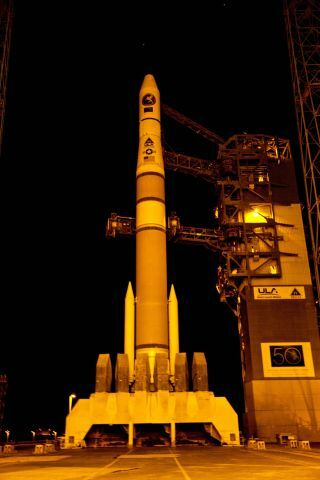 The launch is targeted for 5:57 p.m. EST (2257 GMT) from Complex 37 for the classified satellite deployment mission. Weather forecasters are predicting 90 percent odds of acceptable conditions for launch, with only a sight concern of winds gusting to the 20-knot limit. The cold front bringing wet weather across Florida on Wednesday night into Thursday is expected to clear out, leaving a launch time outlook on Friday night to include just a few low clouds, some scattered high cirrus, north-northwesterly winds of 10 peaking to 15 knots and a temperature of 65 degrees F.
Favorable conditions are supposed to continue through the weekend, if the backup launch opportunities are needed Saturday and Sunday. The Delta 4 rocket will head eastward after liftoff, its pair of strap-on solid motors delivering an added boost of thrust to the vehicle's cryogenic main engine for the initial ascent. The rocket is known as the Medium+4,2 configuration, which flew the Delta 4's maiden mission in 2002 and several times since then. The National Reconnaissance Office is the secretive agency responsible for fielding the country's fleet of spy satellites for the intelligence-gathering community. The identity and purpose of the craft launching Friday are details the NRO doesn't advertise publicly . This launch continues a remarkable surge of six rocket flights carrying new NRO satellites in just seventh months, from start to finish. Spaceflight Now is offering live launch updates and coverage here throughout the day.